Every payment gateway, processor, or bank uses its own payment system (often a unique one). In order to establish a new payment gateway or payment processor relationship your business has to go through labor-intensive and time-consuming integration process that allows you to get certified by the respective gateway or processor and start processing payments. As the number of your partnerships grows, you have to spend more and more time and effort on new certifications and on adaptation of your payment system to the requirements, imposed by new partners. However, if you are partnering with entities, with which you are sharing the same payment technology (such as UniPay), you can enjoy the benefits of collaborative payment processing almost at once. Instances of this technology unite into a so-called payment gateway cloud, in which the interface and all basic functions are already unified. You can share local integrations with banks, gateways, and processors, which other users of the technology already have. You do not need to implement these integrations all by yourself, as they are already available to all cloud members. 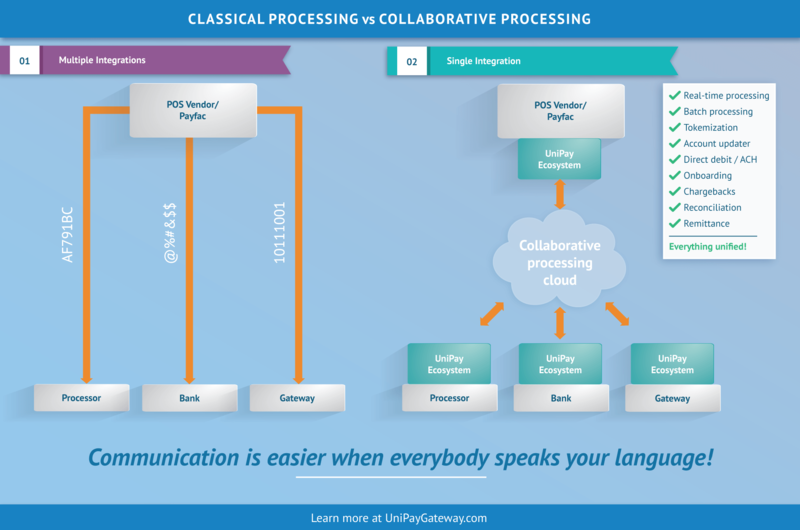 More information on the benefits of collaborative payment processing is available in the respective article on Paylosophy blog.